The hardware store is located in Cruz Bay on St. Thomas. We have been in and out of this bay numerous times due to several factors. 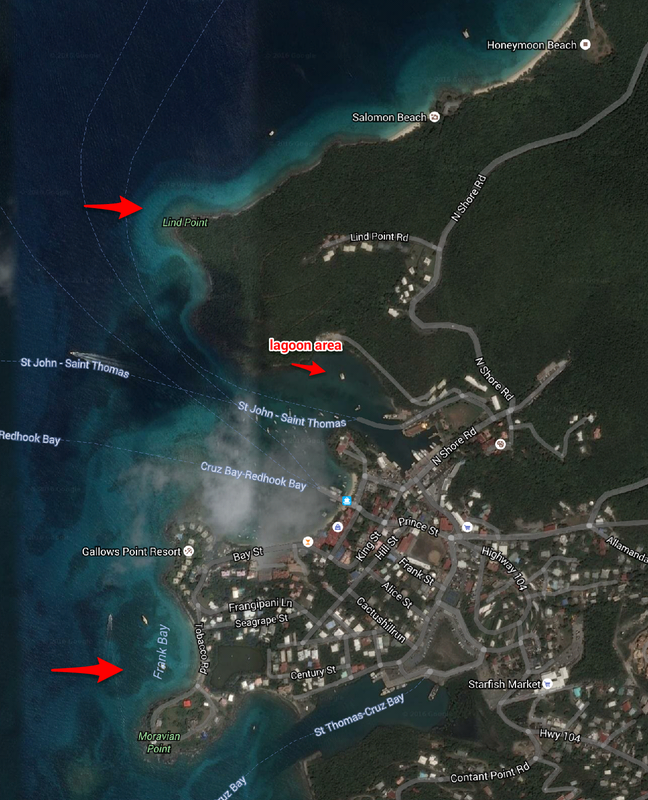 1) Customs is located there and 2) It is a relatively easy spot to pick up visitors joining us on the boat. The problem is the bay itself. 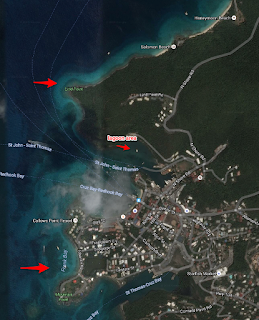 It is full of private mooring balls with no room to anchor, so any visiting boats have to anchor in Caneel Bay, the next bay over, and dinghy around Lind Point to get to Cruz Bay. Now we are faced with getting our belongings from the crate, down the hill somehow (taxi? rented car? 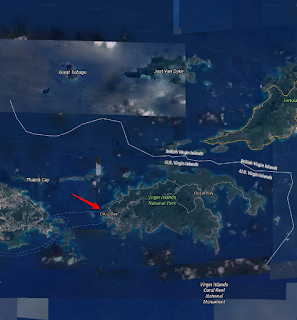 ), into the dinghy, around the point to Rhapsody, and repeat, perhaps several times. How much can we get into the dinghy at once? How many trips will we need to make? Who will watch the remainder of the pile we leave behind as we are ferrying the rest to Rhapsody? Hoping to get some help figuring all this out, we walked up the hill to the hardware store to see if they had any suggestions. Perhaps someone there had a powerboat, or knew of one we could hire so that we could make the transfer in one trip, or perhaps they had an idea of a closer anchorage to make the dinghy trips shorter. The results from the hardware store were mixed. Initially we were just told "no- there are no power boats", "read a guide book" "if you are going to live around here you are going to have to know this stuff" all said in a rather derisive tone. Not very helpful to someone new to the area. Additionally there are no guide books that talk about the kind of specific information we were looking for. We did find someone who was a little more helpful. He suggested an area that we could anchor, and cut the length of the dinghy ride in half . We were a bit skeptical due to the depth of the water in the area he was suggesting, and the depth of our keel, but we were certainly willing to give it a try. The hardware store agreed to use their truck to bring the crate closer when we were ready, so we left them, saying that we would call when we were situated and they could come on down the hill. Back to Rhapsody we went (down the hill, and dinghy around the point ). We motored Rhapsody around Lind Point and into the small lagoon. As soon as the depth started rising, our depth finder decided to take a break. It was tending to do this at the most inopportune moments. We were not willing to take a chance of running Rhapsody aground , so we turned her around in the narrow channel and took her back out into the bay. Motoring in circles in the bay, we called the hardware store. "You could try Frank Bay, and then dinghy around the point to the ferry dock"
This was a much shorter dinghy ride than the original plan, so off to Frank Bay we went. In Frank Bay were two other boats at anchor. In the far NE corner was a sign warning "Do Not Anchor, Dangerous Electric Cables". Having respect for the sign we went as far away from it in the bay as we could, and the other two boats were positioned between us and the sign (remember this bay was recommended to us). Figuring that we were safe to drop anchor, that is what we did. Anytime that we can after we drop the anchor, one of us will snorkle over the top of the anchor to make sure that it is set properly , and the chain is not caught up on any rocks or coral heads. Bob went in this time, and when he came back he said the anchor was fine, set well, deep in the sand , but our chain was lying directly over the very large power cable. Very carefully, we pulled up anchor, called the hardware store, said that we had had enough trying for the day and that we would make another effort tomorrow. 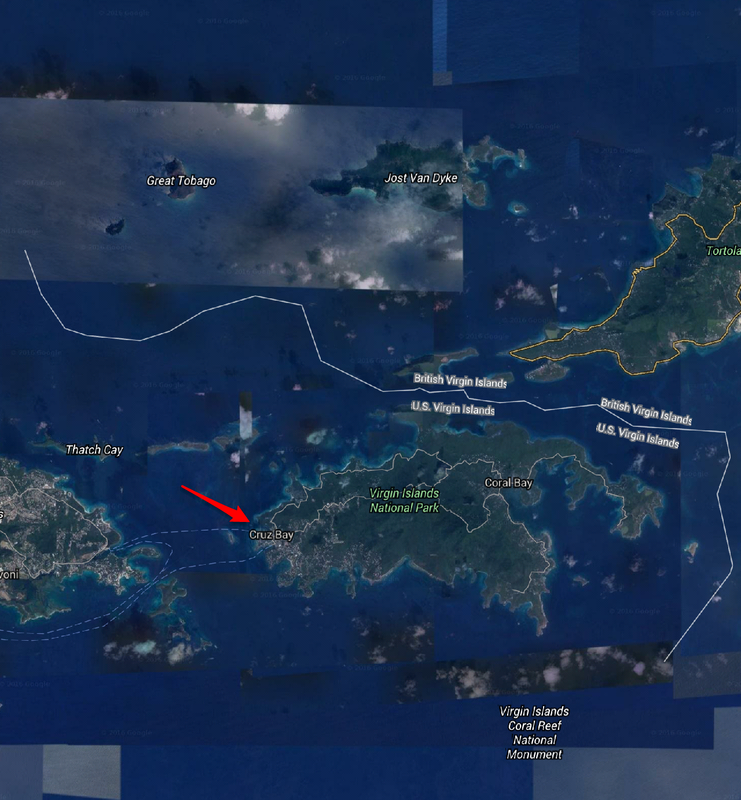 Back to our mooring ball in Caneel Bay to make plans for another attempt.